Top Shelf wants to be your Friend! News | Top Shelf wants to be your Friend! One of the things we're most proud of -- and grateful for -- here at Top Shelf is our ability to build relationships with our readers. Customers become fans, and fans become friends. If you've ever been to our booth at a convention, you know what we mean -- conventions are a great time to see old friends, make new ones, and nurture those relationships year after year. But hey, conventions only come every so often, and we can't travel everywhere we'd like to! So we'd love to stay in touch with you all year-round... and here's the perfect way to do it! 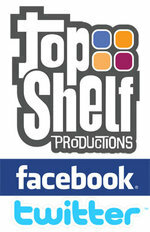 Announcing: the official Top Shelf Productions presence on Facebook and Twitter! Follow us on both sites for news, updates, photos, videos, and more! Both Facebook and Twitter are also great places to ask questions and connect with the Top Shelf team as well as with fellow fans. Finally, you can also follow us individually on Twitter as @brettwarnock, @chrisstaros, and @leighwalton. Now more than ever, we are -- your friends thru comics!